Cheese lovers, this one’s for you. 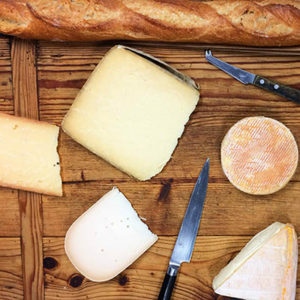 This week, New Haven cheese expert Jason Sobocinski—one of our all-time favorite guests—joins the party once again with ideas for your fall cheese plate. Alex Province pours both a red AND a white wine to go with those cheeses, and Chris Prosperi shares a quintessential Oktoberfest meal: bratwurst and sauerkraut. Make it for the weekend tailgate. It’s a winner. There’s beer, too! Jason shares an authentic Bavarian festival Märzen-style beer, and we revel in a smooth Oktoberfest brew from Two Roads (located right here in Connecticut). Ein Prosit! • Jason Sobocinski — cheese expert, owner (and/or partner) of foodie destinations around the state: Caseus Formagerie & Bistro, Ordinary, The Cheese Truck, The Mystic Cheese Company, and Black Hog Brewing Co.